Students in the Upward Bound Math and Science (UBMS) program spent part of their summer learning biology, algebra, Chinese and more while getting acclimated to college life at Southern Illinois University Edwardsville. Forty ninth-graders from the SIUE East St. Louis Center’s Upward Bound Math and Science program came to the University on June 23 and will leave July 24. The high school students from the East St. Louis School District 189, Cahokia School District 187 and Madison School District 12 are residing in Bluff Hall while taking their courses. During the day students migrate to various classes, in addition to working in the STEM (science, technology, engineering and mathematics) computer lab and taking individual academic counseling. The students’ evenings are occupied with tutoring, studying and recreation. “We get to gain the upper hand academically by taking classes similar to college classes,” said Sharlena Owens, a student at East St. Louis Senior High School. The college experience also affords the students to learn more about maturity and the responsibilities that go along with it, said Septembre Lewis, Math & Science Bluff Hall supervisor. Lewis is a Math and Science graduate and was a student when McIntosh led the program. “The program prepared me for the college experience,” she added. Lewis earned a bachelor’s in nursing from SIUE in 2012. “What I enjoyed most was being exposed to all the options available for me. McIntosh is quick to point out the competitive advantage Math and Science gives students. “The UBMS program is a great extension to our students’ academic careers, which is what I believe, contributes to why our students rank at the top of their class and are awarded highly competitive scholarships. The program is accepting applications for ninth grade students in school districts: East St. Louis, Cahokia and Madison. For more information, contact McIntosh at 618-482-6961 and elharri@siue.edu. 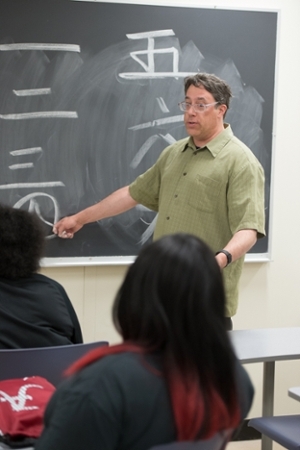 Upward Bound Math and Science students listen to Dr. Thomas Lavallee, chair of the Foreign Language and Literature Department at SIUE, in a Chinese language class.